Soooooo this parenting business can be rough. My first daughter was a relatively easy baby, sleeping 12h and napping twice a day by about 3 months. Oh and she ate like a champ. Bolstered with confidence as new parents, we’ll have more kids, we said. Twins. Are. A. Whole. Different. Ballgame. 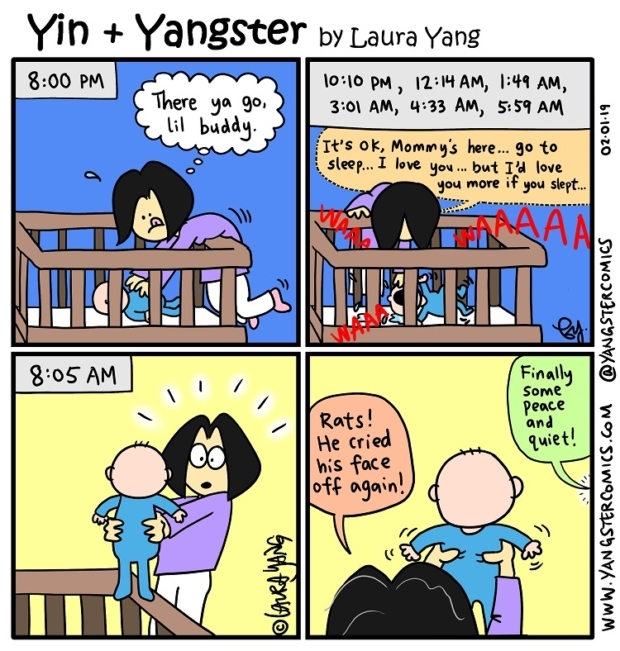 I’ve been bouncing back and forth like a ping pong ball, each twin as a ping pong paddle as I tend to each of their cries at night, when sanity grants me permission. Lately, my boy who eats and poops like a pro has been crying way too often at night. I can handle 3 h intervals but 1 h to 1.5 h, nope! I do check in on him to make sure he’s not having a massive turd but it just seems to be heightened fussiness. The kind that’s 0 to 100 in 0.2 s, high-pitched shriek that I swear set off some car alarms in our neighbourhood. It is birth control right there. It’s the stuff that makes your reproductive organs shrivel up and retreat further into your nether regions. In fact, this is a rather late post since I was interrupted many times last night drawing up the cartoon. As a result, it’s not as polished as I’d like. And yes, I was exaggerating a wee bit but DAGNABBIT, sleep, child!!! SLEEEEEP!!! Ps… The doctor said it was time to sleep train and it could be the usual stuff like going through a leap, teething, growth spurts etc.